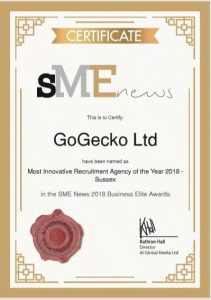 GoGecko Wins Award – Most Innovative Recruitment Agency! Fantastic news – we have won the Most Innovative Recruitment Agency – Sussex 2018 Award. GoGecko specialise in a high touch personal recruitment service for both clients and candidates. People are at the heart of our business and getting the right fit is of paramount importance to us. The job and the CV are only a part of the picture. It is about us understanding what makes you tick, both the company culture and the person behind the CV. We are proud to receive this award in light of that recognition. To understand the GoGecko experience contact us now to see if we can help.